We proceed with our series of articles devoted to popular exposition of theoretical basics of modern wireless technologies. This article was initially planned to be about WiMAX (Worldwide interoperability for Microwave Access). Its world recognition is imminent in the nearest future. And it has been used in some areas in Russia for a year already (for example, WiMAX access in Moscow is provided by Cinterra). An important event happened on October 24 — a session of Radio Frequency Commission of Russian Ministry of Communications. It finally approved the long-awaited decision to allocate 900, 1800 and 1900 MHz frequency ranges to 3G UMTS networks (Universal Mobile Telephone System). It means that HSDPA technology (High-Speed Downlink Packet Access), available in a number of countries in Europe, North America, and South East Asia with their WCDMA networks, will be most likely available in our parts as well. HSDPA, which appeared prior to WiMAX all over the world, except for the Russian Federation, is considered its main competitor. There are plenty of reasons for it. The next section will briefly describe the history of this issue. If you know the history of development of 2G and 2.5G standards, you may skip this section. Convergence or War of the Worlds? As you may already know from our previous articles, mobile telecommunication technologies have suffered some qualitative changes for almost thirty years of their development, which resulted in their division into generations: 1G, 2G, and 3G. The first generation (1G) had analog standards. The first break-through was made at the upgrade to digital standards of the second generation. We should single out two main trends — TDMA and CDMA. The most popular GSM format belongs to the first group (read our earlier articles). According to analytic forecasts, this format should play the main role in the world for another several years. This standard was initially designed for high-quality voice transmissions. And it still copes well with this task. But as there appeared global demand for Internet access from notebooks, and later on, from PDAs or smart phones and mobile handsets (WAP), it turned out that the GSM standard in pure form does not do it very well (maximum throughput is 9600 bit/s). Then there were invented data transfer technologies (GPRS and EDGE) for this standard, which users (together with UMTS users) number nearly two billion (out of 2.41 billion) people. They are sometimes called 2.5G technologies. The CDMA standard is more fit for data transfer. But there were added 1x RTT, EV-DO and EV-DV technologies not to damage voice transmission quality. The baseline modification of CDMA2000 belongs to the third generation - according to IMT-2000 specifications, its data throughput is no less than 384 Kbit/s, which is sufficient for bidirectional video communications (320x240). Having split in the second generation, cellular communication technologies were reduced to a common denominator — WCDMA. It's a 3G standard, which underlies UMTS networks. It's not surprising, because sooner or later high data transfer rates require the same technologies. That's why the GSM-GPRS-EDGE-UMTS "tree" has grown "branches" for encoding and multiplexing channels, and the AMPS-CDMA-CDMA2000-WCDMA "tree" — division into subbands and OFDM (orthogonal frequency division multiplexing). At the same time, wireless technologies that had been initially created solely for data exchange use code division of bands and OFDM. As we have already said, it's inevitable. But while data transfer technologies in cellular communication networks and wireless networks couldn't compete with each other and supplemented each other at the previous stage, when the market was dominated by 2G and 2.5G standards; now, with the increased Internet access rates in cellular communication networks on one hand and with the enlarged coverage of wireless networks on the other hand, different "worlds" started to compete with each other. We have a unique opportunity to see which approach will survive: cellular communication networks designed for voice transmission and offering broadband access to digital networks (Internet in particular); or wireless networks designed for data transfers, which successfully mastered VoIP technologies (Voice-over-IP). To all appearances, that's the reason why engineers are not in a hurry to deliver 4G specifications, though some information still leaks to press. There is a well-grounded opinion that when 4G standards are ready, they will include technical solutions, which are currently used in wireless as well as cellular communication networks. As follows from its title, this technology belongs to the family of solutions that use packet data transmissions. This family also includes GPRS and EDGE. Physically, HSDPA is a superstructure over WCDMA/UMTS networks, so it's often called 3.5G. The "half" in this informal name is also justified by the fact that startup HSDPA bandwidth is 1.8 Mbit/s, while the theoretical maximum is 14.4 Mbit/s. But it's far from the theoretical maximum so far — this technology has just exceeded 3.6 Mbit/sec for two years. However, the strategy adopted by many suppliers (Option in particular) consists in delivering ready devices that support higher throughputs than provided by the operator. They can only wait for the bright day when an operator will upgrade its base stations (operators have to change their equipment) and voila - you can download files at 7.2 Mbit/s. An obvious advantage of this technology is that communication range practically equals distance range of a base station (with some reservations to be mentioned in the end of the article). The drawback here is that high speed is available only for downlink, uplink will be at the baseline WCDMA speed — 384 Kbit/s. We can expect this drawback to be fixed with the appearance of HSUPA (High-Speed Uplink Packet Access). The HSDPA+HSUPA combo will be called HSPA (High-Speed Packet Access). Picture 2. 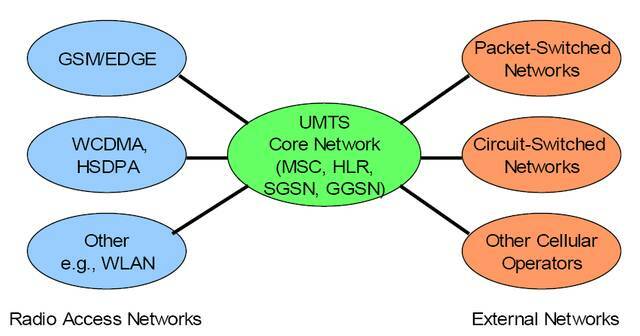 Structure and interaction of UMTS networks. As you can see on the first picture, the GPRS/EDGE reserve is not yet exhausted. Data transfer rates can be increased by using methods of bandpass load optimization, simultaneous transmission and reception of signals, new modulation schemes — these are already available methods. And there will certainly be new approaches to prolong the life cycle of these technologies. But being superstructures over TDMA, they won't make a break-through — upgrade to another physical level (UMTS) is required for it. UMTS (Universal Mobile Telecommunications System) uses WCDMA. But at the same time, the infrastructure inherited from previous generations will be also included into the mobile communications system — it's called universal for a reason. As you can see on the second picture, the UMTS core consists of Base Station Controllers (BSC), Mobile Switching Center (MSC), Home Location Register (HLR), Serving GPRS Support Node (SGSN), and Gateway GPRS Support Node (GGSN). UMTS inherited all these nodes from GSM/EDGE. Moreover, we can see that WLAN integration is possible already at this stage. Bandwidth of UMTS Release 99 channels depends on a spreading factor (it determines a number of channels, encoded in a single subband) and can reach 768 Kbit/s (spreading factor = 4). Theoretically, this standard allows to assign three such "downward" (that is directed from a base station to a mobile terminal) channels to one user, which allows to reach 2 Mbit/s bandwidth. But in practice (don't forget, the more users, the greater spreading factor), the spreading factor in downlink channels is fixed to eight, which corresponds to 384 Kbit/s. Besides, many operators do not provide higher bandwidth deliberately to make users switch to HSDPA. For your information, the spreading factor for voice communications is from 128 to 256. Picture 3. 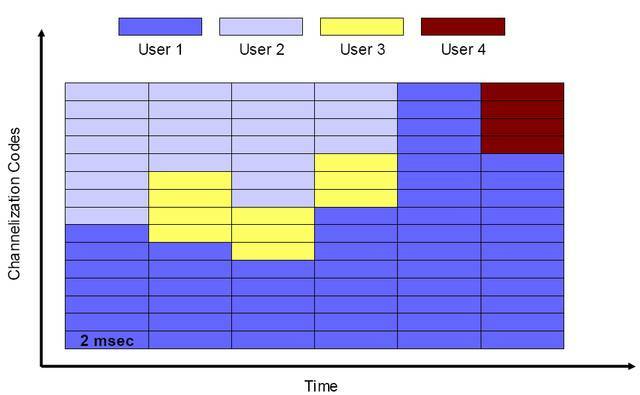 Spectrum distribution between users. Noticeable "inequality" (see the picture) has to do with granting channelization priority to users with the best signal quality. 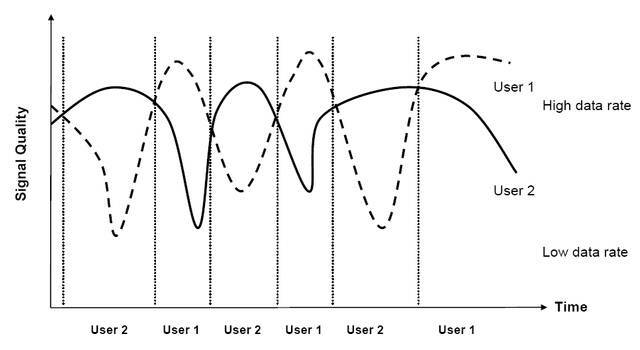 Hence, "fast" users get a piece of traffic and "digest" it while the signal level is low, waiting for "better times". We repeat that the system monitors the signal level at 2 ms intervals. Picture 4. Channelization depending on reception conditions. HSDPA uses WCDMA QPSK (Quadrature Phase-Shifting Keying) and 16-QAM (Quadrature Amplitude Modulation). We mentioned these modulation schemes in the article devoted to EDGE. The first modulation scheme transmits two data bits in a character, the second — four bits. But the latter modulation scheme can be used only if the signal level permits it, to be more exact — signal/noise ratio. Irregardless of what modulation scheme is currently used, data are transmitted as redundant code that contains the data proper and additional bits (the simplest example of redundant code is a number plus a one-bit checksum), which may number up to a quarter of a packet length. Now what concerns improvements of algorithms to resend packets that were received incorrectly. Unlike GPRS/EDGE, the new Fast Hybrid ARQ technology (Fast Hybrid Automatic Repeat Request) have both a base station and a terminal (handset) to make sure packets are received correctly. Resent packets take turns with successfully sent packets (the engineers designed the hybrid algorithm to raise the chance of successful reception due to "similarity" of such packet groups). A number of European operators already provide HSDPA services with the 3.6 Mbit/s bandwidth (Categories 5 and 6). Another barrier is expected to be passed next year, data reception rates will reach 7.2 Mbit/s. The band allocated in our country will assumably allow to use two 75 MHz frequency ranges (in the 1800 MHz band) or two 35 MHz ranges (in the 900 MHz band) — like in Europe. We can only hope that HSDPA will also be available to our users soon. This technology got its name (1) due to its implementation of the so-called last mile communications (hence the interoperability), and (2) due to the fact that it was initially (June 2004, when the 802.16 standard was designed) planned to use the 10-66 GHz frequency range (hence the Microwave Access). But later on the frequency range was modified to 2-11 GHz (802.16d). And now WiMAX, Wi-Fi (2.4 GHz and 5.4 GHz) and UWB frequencies overlap. However, they peacefully co-exist, as each of these technologies uses different approaches to encoding and transmitting data. But WiMAX technology is similar to Wi-Fi in many respects, of course. That's because there are not so many ways to increase wireless bandwidth. So the engineers that push the technical progress forward have a limited set of tools, though they still manage to invent something new each time. At the same time, WiMAX shouldn't become a direct competitor to Wi-Fi. This technology will most likely be a strong competitor to datacom technologies in mobile communications networks. Mobile communications have reached a global level — according to some estimates, mobile communications networks cover 70% of land on Earth, and a number of mobile users reaches two billion, about one third of the entire population on Earth. When reviewed at this angle, Wi-Fi networks evidently stand little chance of going global, because wide coverage requires too many access points - too expensive and inexpedient. But it does not at all mean that Wi-Fi is a "defective" technology - its potential has not been exhausted yet. And the demand for high bandwidth, which will not stop to grow: MIMO technology, already available and mandatory in the 802.11n draft specs, can provide over 100 Mbit/s (in 802.11g networks), so Wi-Fi will have to become a real alternative to wireline LANs. Picture 5. 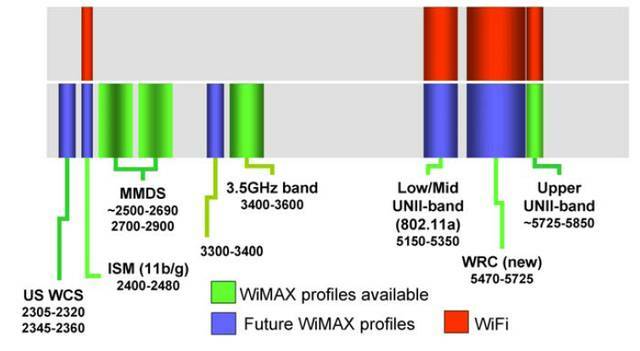 Available and planned frequency ranges for WiMAX. Like UMTS, WiMAX is a whole family of standards with the channel widths from 1.5 MHz to 20 MHz. According to the IEEE 802.16d specifications, approved in June 2004, there are three different PHY levels: the first one, 256-dot FFT (FFT — Fast Fourier Transform) OFDM, is mandatory. Besides, WiMAX family has two optional standards: SC (Single-Carrier, which brings this standard near CDMA) and 2048 OFDMA (Orthogonal Frequency Division Multiple Access). By the way, OFDMA is a new approach to multiplexing channels, it has been developed from FDMA (Frequency Division Multiple Access), which was used with TDMA in GSM. Along with OFDM, WiMAX supports a lot of modulation schemes — BPSK, QPSK, QAM16, and QAM64. In a theoretical case of maximum signal level that allows to use the quartet modulation scheme QAM64 and to have only one user in a system, who will have all 192 carriers, 20 MHz wide each, bandwidth of a base station for such a user will be 75 Mbit/s. But it does not happen in practice, of course. A user will not have so many vacant frequency ranges (192*20=3840 MHz). We'll discuss communication ranges separately — I'll get down to it a tad later, when we'll compare WiMAX and HSDPA. The most widely-distributed frequency range these days is 3.5 GHz (3.3 GHz-3.6 GHz), which maximal bandwidth reaches 5.86 Mbit/s. Another important difference between WiMAX and Wi-Fi, as well as actually HSDPA, is possible communication between terminals, which are not on the line-of-sight. It's done by using rounding and reflecting signals from obstacles as well as retranslation of data directed to one terminal, to several other terminals, when one or several of them are in the line-of-sight with the addressee. This approach is similar to mesh networks. But WiMAX has limitations - some terminals (access points or routers) must be connected to WAN, while mesh networks are supposed to be all-sufficient. However, the existing mesh technologies are closed so far. 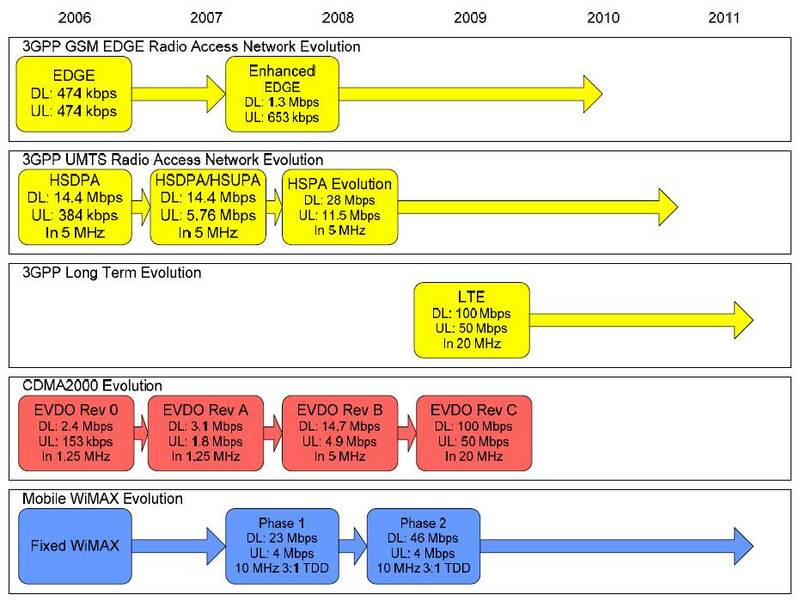 But there is hope that the IEEE will have the first mesh standard by 2008. Like the latest cellular communications networks, digital wireless networks pay much attention to QoS, which allows to prioritize traffic. QoS WiMAX differs from QoS HSDPA: the main difference is the mechanism of queries and permissions. Each group of packets includes a contention slot for establishing a new session with a client terminal. QoS also includes an algorithm to specify a modulation scheme to each user. Uplink and downlink traffic can have different modulation schemes. I have deliberately brought the discussion of communication ranges in a concluding part of this article. Nature is obstinate. Despite all our tricks, there are certain things, which are impossible to get. Theoretically, WiMAX range may reach 30 km (similar to the commercial range of a GSM cell), 75 Mbit/s bandwidth. Considering that the real bandwidth is much lower than theoretical, we shall take the above estimate of 5.86 Mbit/s. But you shouldn't think that the bandwidth at 30 km away from the access point will also be 5.86 Mbit/s, like at 500 meters. The farther a terminal from a base station, the weaker the signal (the worse signal/noise ratio). So a modulation level is reduced, fewer bits are transmitted in a single symbol. We should also take into account that a higher-frequency signal is better absorbed by the air. So the signal/noise ratio in WiMAX at 3.5 GHz will go down faster with the distance than in GSM. The situation with HSDPA is no better. According to some estimates, you can get its maximum bandwidth (14.4 Mbit/s) at less than a kilometer from a base station. At 6 km, the data rate drops to less than 1 Mbit/s. Here is the principal difference of HSDPA: where a user cannot get the highest bandwidth, the technology still allows to use data transmission services, but with lower bandwidth (on the level of WCDMA or GPRS/EDGE) — dozens of Kbit per second. Thus, we cannot say that the communication range is a forte of this or that technology. But we should note that WiMAX base stations can connect to each other even when they are not in the line-of-sight. The true forte of HSDPA is the fact that this technology is initially intended for lots of simultaneous users, while WiMAX is limited to dozens, or hundreds terminals at best. Moreover, experts forecast serious problems for WiMAX in corporate networks, when the number of their users grows. We cannot say that HSDPA lacks these problems. If all users suddenly decide to download a large file from Internet, it will certainly affect data rates. But in case of HSDPA (this feature is inherited from CDMA), all users will just have lower data rates, while the load on a WiMAX router in a similar situation goes up, and it may fail to cope with it. The gain in WiMAX versus HSDPA bandwidth at the same distance from a base station is not that evident so far. First of all it's because WiMAX does not have many frequency ranges yet. But if HSDPA, being an evolutional step in the development of WCDMA, is getting close to the threshold of spectral efficiency, while WiMAX has much more possible ways of development — new frequency ranges (from 10 GHz to 66 GHz, remember? ), new modulation schemes (as well as combinations with the old ones), and MIMO (multiple-input-multiple output). Both technologies have practically the same capacities for transmitting multimedia data. Both WiMAX and HSDPA have QoS and traffic prioritizing. The choice between voice communications in WCDMA/HSDPA or VoIP/WiMAX, is a matter of taste from the technical point of view. But not in economic terms — VoIP traffic is much cheaper than WCDMA traffic. HSDPA does not provide any additional security functions. Users are authenticated by their SIM (or R-UIM) cards. Data encoding for different users, typical of all CDMA standards, works better than any cryptographic algorithm, but not if an intruder is in a base station or somehow gets its channels code (like special agents). WiMAX supports modern cryptographic algorithms (AES with a 1024-bit key, for example). It will certainly please corporate users, who want to keep their data in secret. But this secret will not hold forever, as there are no security measures that cannot be broken. It's impossible to appoint a certain favorite among these two technologies. Both of them have fortes and drawbacks. We can only note that the whole world started using HSDPA earlier than WiMAX. So it has already taken root. But the situation in Russia is contrary - WiMAX is already in use, while it's difficult to say when the first WCDMA networks are going to appear, to say nothing about HSDPA. But it's always good when there are two competing technologies on the market. On one hand, this situation stimulates technical progress; on the other hand, it always leads to the reduction of prices for consumers - it's good, isn't it?